What do you think of this Third Rail concept logo? It was posted to the group's Facebook page a few days ago. I think it's interesting. I like the simplicity. It works as well as an icon as at larger sizes, which is a must. 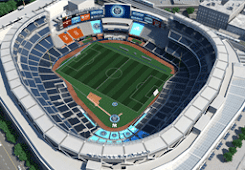 I would change the black to dark blue, myself, to keep within the club's larger color scheme. I'm not so sure about the skull, though. I think the motif is a little played out. 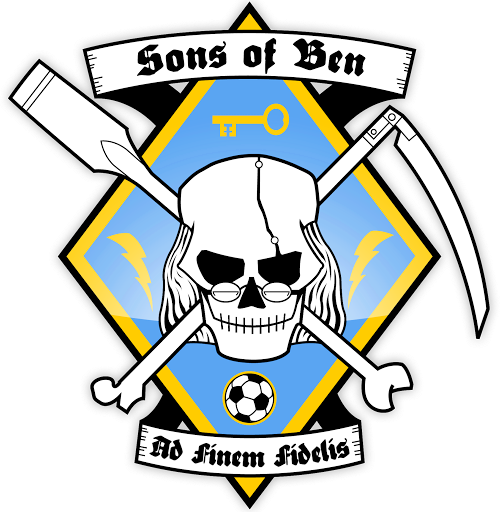 The Sons of Ben use a Ben Franklin-styled skull in their logo, and of course the Borough Boys, the largest supporters' group for the New York Cosmos, adopted a Cosmos-themed skull logo. That might be too many skulls in one league, or one city. Perhaps if our skull was personalized in some way, like a Statue of Liberty crown. 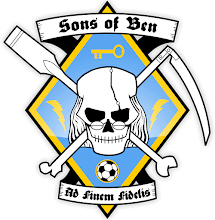 I do like the simplified representation much better than either the Borough Boys' overly-detailed Gray's Anatomy drawing or the rough rendering of the Sons of Ben. Finally, I really hate the use of "TRSC" as an initialism. If anything, I think we should be promoting "TRNYC" as an official abbreviation. We'll see how that looks in Gotham font. So what do you think? Is this the direction we should be looking?